Brushing Scalp to Regrow Hair - It WORKED for Her Receding Hairline! Is brushing hair good or bad for hair growth? There is a lot of controversial information when it comes to brushing scalp to regrow hair. 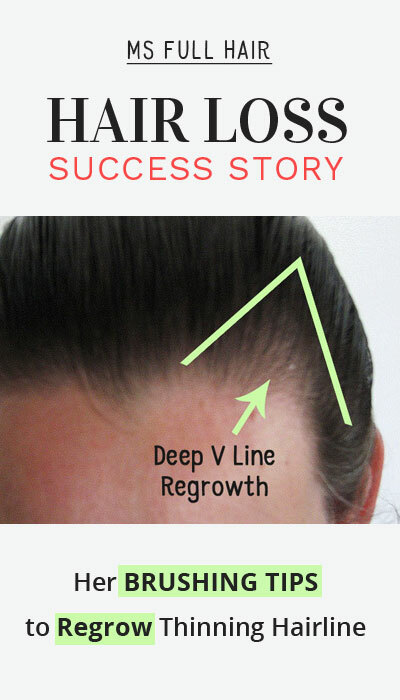 The latest hair loss success story we found shows a great experience to regrow hair in her receding hairline. 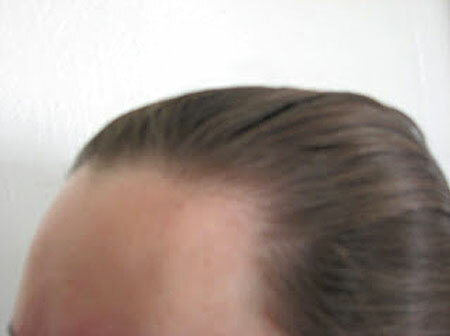 This story (1) is from a woman named Pam who reversed her receding hairline using a simple tool – Hair brush. If you have thinning hairline (female and male) on the frontal hairline, on sides, or both, you may find her brushing technique helpful . Pam realized her hairline was visibly thinning from a hair salon visit. When Pam told her stylist about not being able to style the front of her hair any longer (by showing her one of her old photos), the stylist pointed out that it’s because she did not have much hair compared to the photo. The stylist then picked up a mirror for Pam to see closely. She realized there were deep V lines along her hairline at temples. Needless to say, it was very concerning to her (and generally concerning to all women). 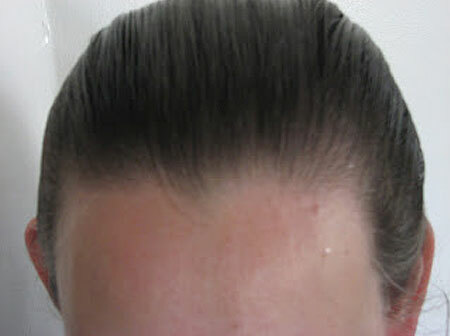 But, the stylist actually gave her a very useful tip on how to regrow hairline naturally (Also read this hair loss success story for reversing receding hairline). The stylist told Pam if she brushes hair, especially focusing on thinning hairline (where there are usually little fine hairs around the edge), her hair would regrow back within a few years. Thus her brushing journey began. OUR NOTE: It looks like she actually shared some of her progress photos (which she notes – April 1999, then 3 years later, June 2002) by sharing a link that points to one of those photo sharing sites. However, we noticed that those photos were no longer available (her article was posted around 13 years ago and the photo sharing site probably don’t keep images that old). We also sent her an email to see if she still has the progress photos of her receding hairline, but the email unfortunately bounced back (again, not surprising after such a long time). We are assuming since it has been more than 10 years since the last update to her blog, she probably doesn’t use that email address any longer. It also appears that she brushed her receding hairline using a bristle brush for years with a continuous use and this helped new layer of hairs growing out in continuous cycles. So was there any specific way she brushed her hair to stimulate hair growth? Below is a complete list of her brushing scalp to regrow hair tips. Which brush did she use? What’s the best brush for hair growth? She says that a stiff boar bristle brush with a curved surface is the best to effectively get to the scalp. This is the specific brush she used. If you have thin hair, she recommends soft boar bristle brush for receding hairline (our recommendation). Wash your brush every 2 weeks by using shampoo and warm water. She says a toothbrush comes handy when cleaning between bristles. Finally, air dry it by facing the bristles downward. She says that her father, who had a good head of hair (but receding now due to aging), always brushes his hair “from the part across the top” and “the crown down the back”. She says brushing it this way, he neglected the crown part, which is where he was showing baldness. She mentions that she was told her husband’s grandfather was nearly complete bald. Why brushing works for hair loss? She says that brushing helps increase blood circulation to the scalp, which your follicles need for strong and healthy hair growth. In the same sense, hair follicles that don’t get proper nutrition have a higher chance of fine hair strands or lead to a shorter life span (= thus falling out quickly). She strongly believes that hair loss is directly linked to the lack of blood circulation on the scalp. And frequent brushing can help maintain that blood flow. Do brushing hair help it grow? Based on her continued experiment for at least several years, she says brushing was definitely helpful for natural hairline regrowth at temples. She also suggests people should take photos like she did in order to measure your progress. Our final words – Does brushing your hair stimulate hair growth? Boar bristle brush and receding hairline: Brushing scalp to regrow hair is one of those controversial topics on what can stimulate hair growth. There are doctors ranging it from good to bad for your hair – claiming everything from scalp brushing is a useful method for extra stimulation, or it’s all just a myth, and even a possible cause of scalp inflammation. On the other hand, there are also people who enjoy brushing hair benefits, which they claim provides better scalp sensation and even scalp massage to regrow hair (In her case, she says boar bristle brush (the brand she used) helped her with receding hairline regrowth naturally). Our opinion? The reason behind hair brushing (scalp brushing to be specific) is to increase stimulating hair growth on the scalp. As long as it’s done in moderation, we believe brushing can be used as a safe addition to your daily hair loss prevention regime. If you want to try her brushing method for regrowing hairs on receding hairline, do the following: 1) Use a boar bristle hair brush, 2) Brush hairline – front and sides (focus on the areas where hair thinning is occurring) for several minutes a day, 3) Try it 2 weeks for initial examination. Have you tried brushing for hair growth? We would love to hear your experience!